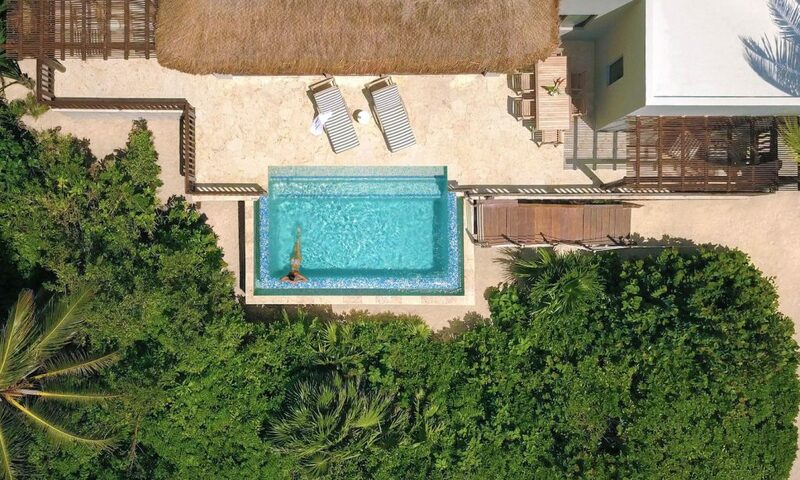 Celebrating its 10th anniversary this year, the most exotic resort in Mayakoba is only getting better. 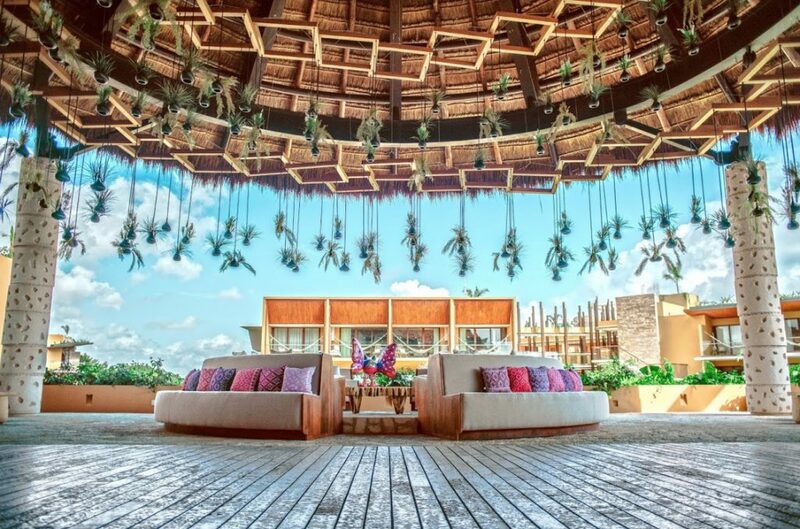 This June, Banyan Tree Mayakoba is introducing MK Blue, a 10,385-sq.-ft. indoor-outdoor event space that can seat up to 500 guests. State-of-the-art equipment, stylish decor and a stunning setting make it the idea location for events. 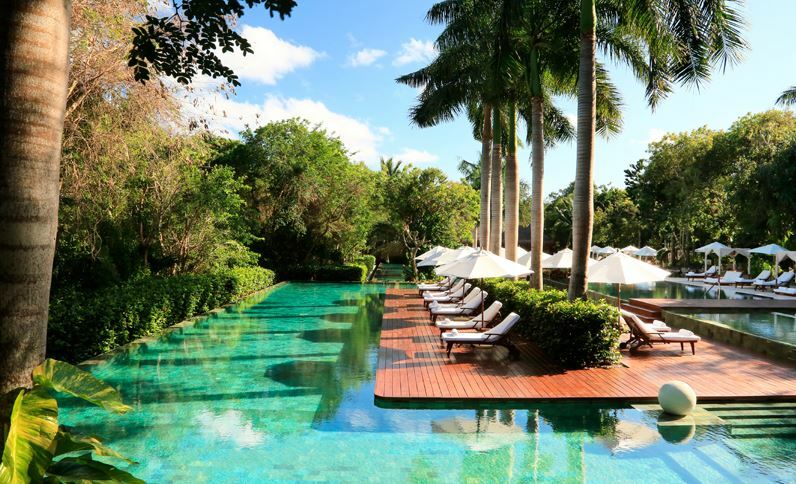 A stay here includes the brand’s signature Asian hospitality along with unbeatable amenities like Far East cuisine, an in-jungle Mayan experience, a luxury spa and more to treat all the senses. Each villa includes a private pool and a landscaped garden along with two complimentary bikes per villas, perfect for cruising the hotel’s three-mile nature trail. Fun Fact: The resort offers a Bee Part of the Melipona Community workshop which supports the conservations of the Melipona Bees, an endangered species sacred to the Mayans. The spa even incorporates the Melipona honey in many of its treatments. 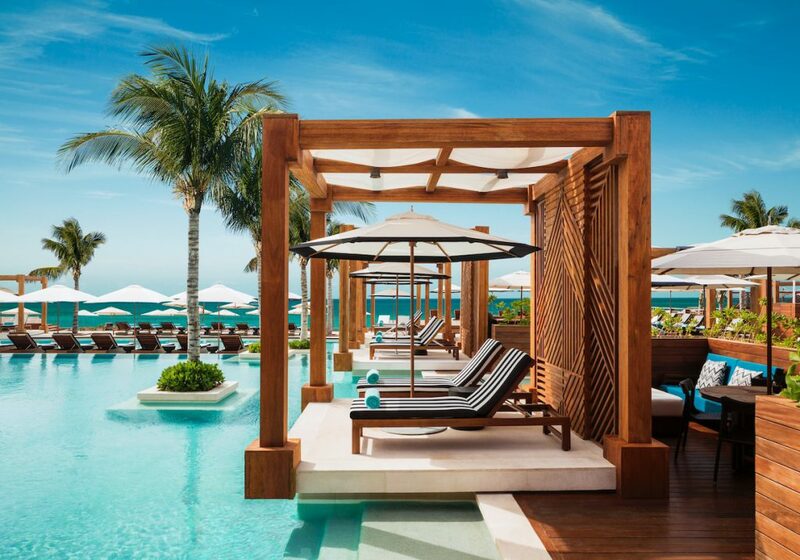 The first and largest of Mayakoba’s four resorts, Fairmont Mayakoba is located in the center of the development with the largest beach area, which was recently renovated in 2017. Home to a special children’t program, a kid’s pool and a variety of activities, the resort boasts the most family friendly vibe in Mayakoba. 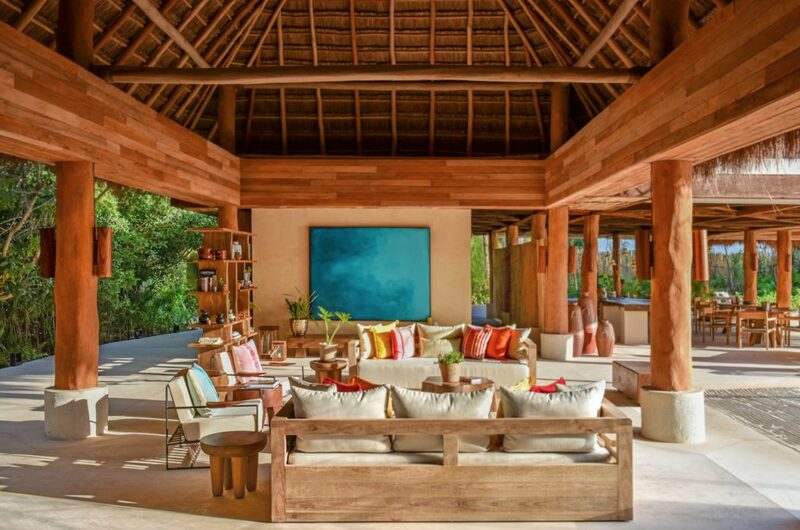 Guests can choose from a slew of accommodations, from jungle rooms to sprawling beachfront casitas with warm wood accents and bright colors. Hungry diners can indulge in renowned Latin cuisine from new Executive Chef Diego Sobrino, pull up a seat at the Chef’s Table of kick back at the stunning lobby bar with picturesque views. Additional amenities include five pools, a Willow Stream Spa, culinary activities and access to the El Camaleon golf course. 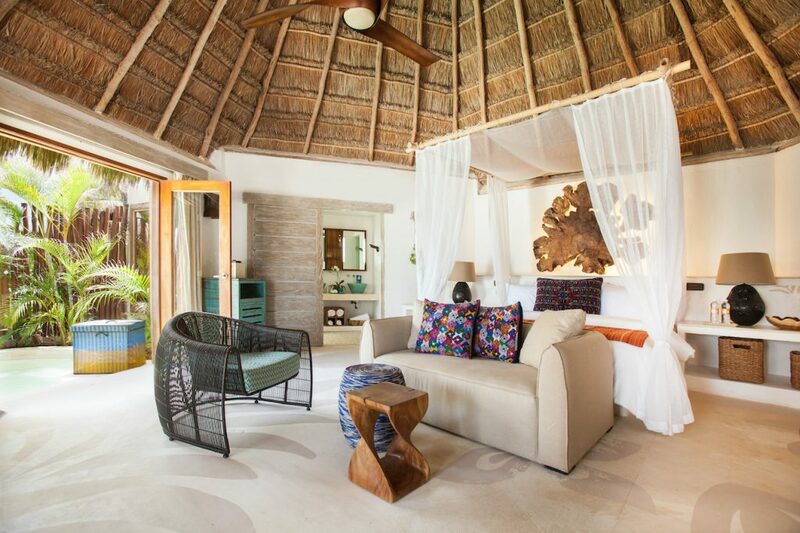 In 2018, Fairmont Mayakoba was awarded its 13th consecutive AAA Five Diamond Award, a prestigious honor they’ve earned every year since their opening in 2006. Fun Fact: La Laguna Restaurant’s Edible Insect Degustations allows guests to snack on dried grasshoppers, maguey worms, ant eggs, crayfish, escamoles and more, all perfectly paired with mezcal. 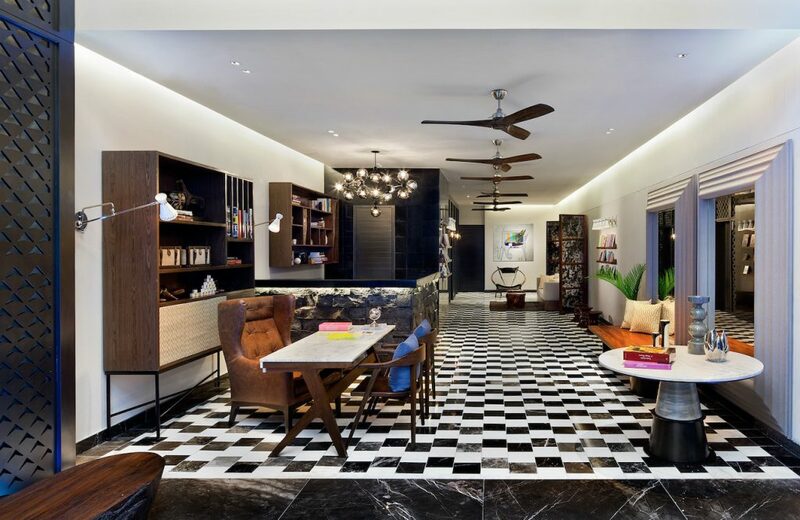 The newest of Mayakoba’ four resorts and the brand’s debut in Mexico, Andaz Mayakoba was built from the ground up and has a fun, upbeat vibe. We recommend booking a stay in a beachfront suite or guestroom which are primely located near the pool, the beach and two of the resort’s restaurants, OllaTaco and OllaCeviche, both serving beach eats like ceviche and tacos. This colorfully decorated hotel is perfect for the younger crowd or anyone looking for a more casual yet still upscale experience. Fun Fact: The water feature and oculus at the center of the lobby is designed to frame and reflect the stars and the sky, a nod to the importance of astrology in Mayan culture. 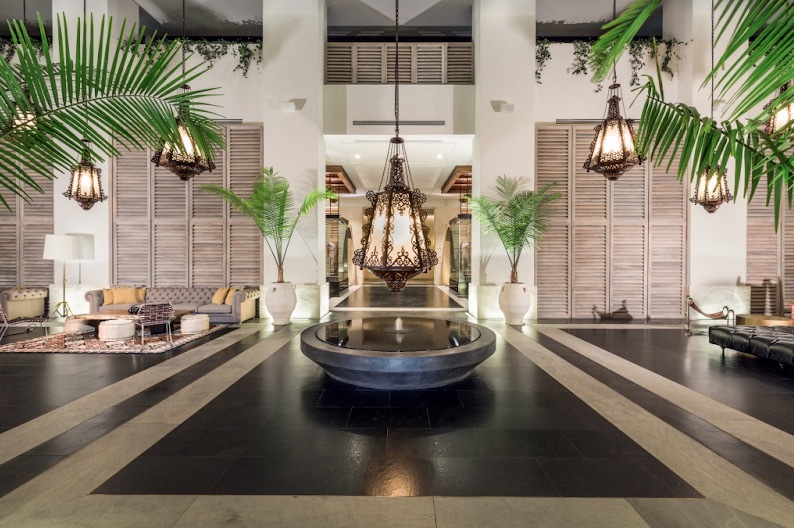 While the hotel’s Main House is located in the heart of trendy downtown Riviera Maya on 5th Avenue, the nights can be lively and loud; you’re offered earplugs to sleep with if needed. If that’s not quite your vibe, opt to stay at the hotel’s more intimate oceanfront Beach House, located a few blocks from the Main House. Guests will enjoy a quieter stay and still have access to the downtown building, highlighted by its 30,000-sq.-ft. “rooftop playground,” which houses an infinity-edge pool and two restaurants. Fun Fact: The resort has been visited by A-listers including Shay Mitchell, Steve Aoki, Bella Thorne, Nelly, Fetty Wap, Jason Derulo and Calais Campbell. 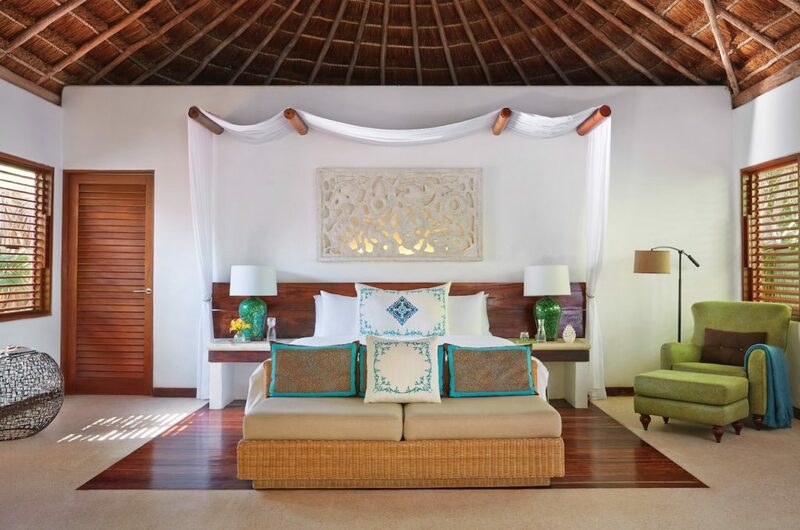 All accommodations at this all-villa resort feature a private patio, plunge pool, outdoor shower, hammock and high-ceiling thatched-roof palapa. Guests can enjoy the lagoon pool, Mayan-inspired spa with a traditional Temazcal sweat lodge or wander down to the resort’s private pier. Other notable features include the hotel’s 500-bottle wine cellar, stocked with selections from boutique Mexican wineries and the property’s Soap Concierge, which stops by your room post-arrival to curate handmade soaps using ancient traditions and regional ingredients. Fun Fact: Guests may stumble upon easels and paints where they can create their own artwork in the rainforest. Keeping in line with Rosewood’s elevated experiences, this sophisticated resort offers an upscale, contemporary feel with a quiet atmosphere. Its most recent debut, Aqui Me Quedo (translated to “Here I Stay”), is the resort’s newest destination. The adults-only retreat was inspired by the residential style of a seaside home and the laid back vibes of nearby Tulum. 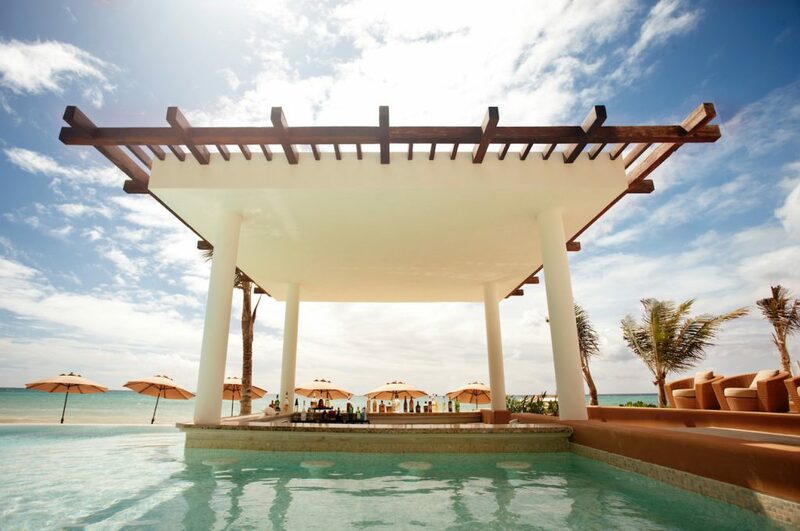 Here, guests will find open-air living and dining rooms, three sunken infinity-edge pools with rotating seasonal amenities (think poolside spa treatments, popsicles, frosé and more); La Cantina, an open kitchen serving the best of Mexican street food and drinks; and La Palapa, a beachfront indoor-outdoor palapa for events and fitness classes. Fun Fact: Guests may come across larger-than-life Alebrijes (wooden, Mexican folk art sculptures) around the property, which each take at least 13 people and four months to create. “Steps from the ocean” takes on whole new meaning at this beachfront resort. Located in the heart of the hustle and bustle of world-famous Quinta Avenida, this hotel has the best of both worlds. On property, you’re in a jungle oasis but just steps from the lobby (literally), you’re amongst street vendors, nightlife and authentic dining. Like something out of a tropical lookbook, this property has it all: branded coconuts, bohemian decor, beachy wooden swings, outdoor Moon Showers and patio hammocks hung upon arrival. Fun Fact: Country singer Jason Aldean and former American Idol contestant Brittany Kerr tied the knot here with Duck Dynasty‘s Willie Robertson officiating the ceremony. Guests included Heidi Klum, Addam Levine and Behati Prinsloo. For the traveler who loves luxury and options, Vidanta Riviera Maya is home to five different resort hotels in the verdant jungle. A Jack Nicklaus-designed golf course, two spas, more than 10 dining options, pools and an array of nightlife and entertainment are just some of the many amenities to enjoy. Fun Fact: The resort is home to JOYA, a one-of-a-kind theatrical culinary experience and the first and only permanent Cirque du Soleil show outside of the U.S. If you thoughts “all-inclusive” and “authentic” could not be found in the same sentence, then you have yet to experience UNICO 20°87° Hotel Riviera Maya. Named for its latitude and longitude of the locations (20°N 87°W), stays here include all the expected amenities of an all-inclusive plus select tours, spa treatments, beauty salon and barbershop services and even unlimited golf for a 25-percent service fee of the service value. Through its chic design and cultural offerings, guests here have the chance to really dive into the culture of the region and explore Riviera Maya’s Mayan culture, all without sacrificing luxury. For a hassle-free way to experience the Mexican Caribbean, check-in to Hotel Xcaret Mexico. From Grupo Xcaret, stays here are highlighted by its ALL-FUN INCLUSIVE program which grants guests full access to all seven Xcaret parks plus the Xenotes and Xichen tours. Food and drinks are also included and a complimentary shuttle is available to transports guests to the park every 30 minutes. Room options at Hotel Xcaret are as varied as the parks and spread across five different “Casas.” Accommodations range from swim-up oceanfront suites to family suites and more. The hotel even has an adult-only section for kids-free fun. All suites here include a private terrace or balcony, in-suite hydro-tub for two and much more. With its unlimited-luxury experience, dine at a variety of outlets or take part in the hotel’s entertainment options like themed party nights, movies under the stars, live music and dancing and more. Or simply relax by the two swimming pools or on the white-sand beach. Located on the white sands of Mexico’s Caribbean coast, this all-inclusive paradise is replete with things to do. A total of 539 suites with more than 1,100 square feet of space feature a private terrace with ocean or jungle views and a plunge pool. Guests will never go hungry with eight different outlets to choose from ranging from French to Asian to Mexican and more. The resort’s spa has collected quite a few awards over the years and with 42 luxury spa suites, an extensive treatment menu, a flotarium room and more, it’s easy to see why. A variety of outdoor activities, a kid’s club, a teen’s club, a karaoke bar, a sport’s bar and more make this an ideal resort for families. 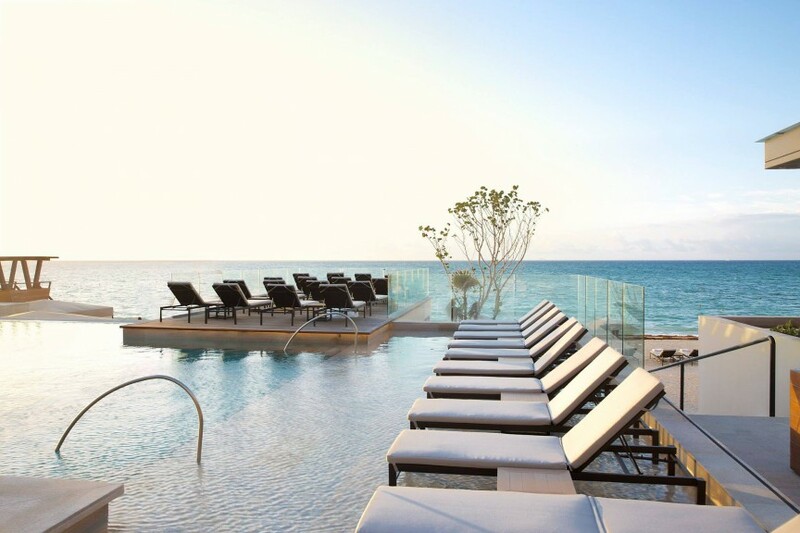 Steps from world famous Quinta Avenida, Grand Hyatt Playa del Carmen is centrally located to all of the city’s action. 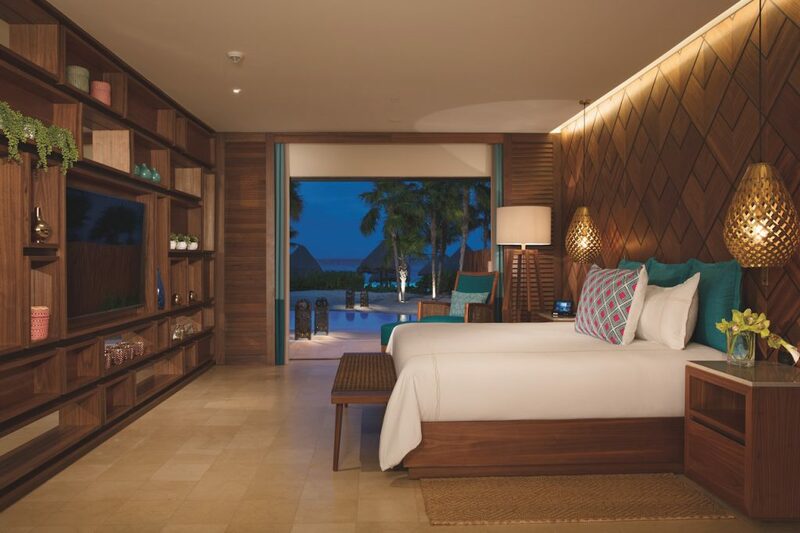 Amenities include three beach-facing infinity-edge pools; the Cenote Spa, inspired by the healing pools; and an array of dining options like the signature The Grill at 1-26. For hungry guests, book the all-inclusive culinary experience to dig into all your favorite eats.